This is a modern hotel, set in a convenient location where all amenities the resort has to offer are nearby. The charm of Tossa de Mar with its rugged coast and picturesque Old Town and the facilities this hotel offers makes the perfect choice for a relaxing holiday. We have recently come back from 2 weeks at the Golden Bahia. The hotel was excellent. Plenty of seating in the lounge areas and plenty of sunbeds around the pool areas. The hotel was spotless and rooms cleaned every day. All the staff were friendly and welcoming. The hotel entertainment was good when we stayed in the hotel. There was a good selection of food every day and we were never stuck for things to eat. I did read that in September there were lots of flies around the area but we went on the 12th September to the 26th and were never bothered at all by flies. The weather was hot and sunny. We will definitely be visiting the hotel and area again. It was only ten minutes to the beach and round the corner from the bus station with connections to Lloret every 30 minutes. The hotel was extremely clean and pleasant upon our arrival. We were promptly dealt with at reception and the room was ready for us even though we arrived early morning. The restaurant was perfect very airy with indoor and outdoor seating, the food was excellent and we even had champagne at breakfast! the staff were most eager to please. The entertainment was the usual Thomson evening entertainment and the 9.00-10.00 bingo slot a bit boring. Shows began at 10.00 which were entertaining. A lovely main pool area although Beware the tiles are very slippery when wet! we saw 4 persons fall over in 4 days!! Hotel is located approx 10 minutes walk from seafront and the walled castle, plenty of restaurants there and beach, sand very soft. Hotel was full so restaurant very busy,tables very close together, choose 'outside area'-more table space.Food buffet style with grilled area cooked to request. Lots of fish and meat dishes but same most nights. Children's animation if required and aqua gym/tennis/rifle shooting etc. for adults during the day. Children's mini Disco every night, bingo and then main entertainment at 10pm if desired. Piano Bar for Adults only. Tea and coffee facilitise in room, vending machines and ice machine available on each floor.Vending machines expensive, ice is free. Had booked extra large room which resulted in awful side view, as hotel full unable to change for pool view, not very helpful and felt upgrade not worth the extra as the pool view would have been better to sit out on balcony. Bathrooms have hairdryer but beware very very hot, worth taking your own as no cold setting on it. Air-conditioning in room worked and very good as we had a scorching week. Safe in room is best we have had, operated with a PIN system, which you choose and even though it was 2 Euros per day, well worth it for peace of mind. Hotel has a security guard at front entrance. There is PS2/Xbox and internet access, 10mins for 1Euro. Left luggage room-handy as rooms not ready on arrival. Just returned from a 4 night break to this hotel with my friend. We booked the junior suite on a half board basis. The suite was large with a jacuzzi on the balcony. It consisted of a large living room with sofa and 2 chairs, large TV, mini fridge (which wasn't switched on for some reason even when you put the key card in), kettle with tea and coffee (which was replenished daily. )large full mirror. The bedroom had 2 double beds, a second TV, and a walk in wardrobe. The bathroom was well equipped and had a bath with overhead shower, toilet, sink, bidet, and separate walk in power shower with lots of nozzles. (Toiletries were provided) and a hair dryer. We had a large wrap around balcony with the jacuzzi. This was excellent and we had a good laugh playing with all the nozzles. Food was good. Breakfast consisted of the usual ham, cheese etc, bacon, beans, mushrooms, potatoes etc and you could have your eggs cooked to order or omelets, also made to order. The jugs of coffee weren't very nice so we used the sachets of Nescafe with a jug of hot water and milk. Evening meals were very nice also. Fresh prawns, small legs of lamb, chops, veal, even Yorkshire puddings one night with carved Turkey. We couldn't complain about the food at all. As others have mentioned the seating area is a little cramped and I would imagine in high season this could cause problems when the person behind you tries to leave their seat at the same time as yourself, due to the chairs being close together. If possible try and get a table on an end. We are a party of 6 including 2 Pensioners and 2 young children. We stayed at the Golden Bahia and thought the hotel was really good. For breakfast there was the usual eggs, bacon & sausage and alternate mornings they would do a champagne breakfast / omelettes or pancakes. For Dinner their was plenty of variety on the counters and they usually had 1 fish and 2 meats being freshly carved on the show counters. We found we were nearly always able to get a table for 6, on the odd occasion when Restaurant was busy it was a 10 minute wait maximum. The hotel pools are fantastic, main pool is the no. 8 shape and it is mirror image both sides, it gently slopes in so the kids had quite a large area to play in. There was also a separate baby pool and a deeper pool at the top as well. There are plenty of lounger's but that still did not stop the rush too reserve beds which sets off at 0800 hrs. The hotel animation team were great, they run various activites throughout the day and they always tried to get guests to get involved. They were also very friendly in the kids club which runs upto 2300 hrs ! if you wanted to put them in until that time. We have just returned after spending 11 fantastic days in this hotel. All staff are polite and courteous and always ready to help. Food was really good and varied,I am sure even the fussiest of eaters would be able to find something. This hotel is spotless. There is a spa, a gym, hairdressers and laundry room. The rooms are cleaned every day and towels are also changed every day. In the eleven days we stayed there the bedlinen was changed three times. The only problem with the room is there is no fridge, but you can hire one. The entertainment was good, a different act every night. A couple of the acts were not to my taste that is why I have only given a 4 for entertainment, but they have to cater for all cultures. The resort of Tossa de Mar is really beautiful with a great deal of bars, shops and restaurants. We would definitely visit this hotel again. Brilliant hotel! Wished we'd gone for longer as we were just getting into the swing of things after 7dys & it was time to come home. Its a perfect place for relaxing & recharging those batteries! Location is on the outskirts of Tossa, about a 10min walk to the old town. Hotel reception was good, all spoke really great English which helps. Rooms were of a good size & ours had 1 double & 1 single in it. Plenty of wardrobe & drawer space. Bathroom good size too. Maid service each day so rooms like rest of hotel were spotless. Breakfasts were good, lots to choose from, definitely something for everyone from cereals, fruits, yoghurts, breads, pastries to traditional english breakfast like Fried Eggs, sausages, mushrooms, tomatoes etc etc. Even done Omelettes made to order each day. Tea, Coffee in plentiful supply as was Orange & apple juice & not forgetting the Cava! Didn't eat in the restaurant at night as there were so many little places in Tossa to try out & we love eating out at night but again I'd imagine there would've been something for everyone. Large pool area with plenty of loungers - pool & jacuzzi's were freezing though....you had to be brave! Never felt crowded at the pool so it was lovely to relax there in the sun. Quite a lot of flies about but we were lead to believe it was due to time of year...they were annoying but wouldn't put us off going back. Lots of entertainment laid on during the day like waterpolo, water aerobics, pistol shooting, archery, football etc but we found it difficult to tear ourselves away from soakin' up the rays! Again there was evening shows on & tribute acts but we spent the evenings down in the town so not sure what they were like. Hotel was really good, excellent standards & in a really lovely resort. Have a brill time if you're going!!!!! We've just returned from this hotel and have nothing but praise for it. It is situated 45 mins away from Gerona airport and a ten minute walk from the centre of Tossa de Mar. The hotel has three outdoor pools, one for 'proper' swimming, one well landscaped with a gradual depth from nothing to about 5ft, making it really good for young children and a baby pool. The pool and outside areas are immaculately kept with plenty of sunbeds and parasols. My favourite part of the hotel was the food, it really was excellent. both breakfast and evening meal were buffet style but everything was always hot and there was something for everyone. Each night they would cook a selection of fresh fish/meats/ribs in front of you, done to your tastes and they also had evenings with a chocolate fountain, kebabs etc.. The hotel also had a cafe and a BBQ at lunchtime, both of which were excellent value for money and very enjoyable. The drinks were reasonably priced, although watch out for the 'long drinks' such as malibu - they fill your glass a third of the way with malibu, then top it up with your mixer, so they're very strong! Our room and the hotel in general was very modern, all the corridors upstairs were carpeted and therefore there was very little noise at night from people walking past. The rooms themselves were beautifully clean, with maid service and towel/bedding changes daily. We had two double beds and a cot in our room so it got quite cramped, but this wasn't too much of a problem as we didn't spend much time there anyway. There were tea and coffee making facilities in the room but no fridge. However, on each floor of the hotel were 'automatic bars'. These were basically vending machines containing snacks,cans of soft drinks, water, beer and even vodka/martini/gin etc. The ice in the machines was free, which was handy for keeping water cold in the room. The entertainment in the hotel consisted of the kids mini disco at 8.30, followed by an hour of bingo, then at 10.00, the main show. This was watchable, but we found plenty going on in Tossa. The staff in the hotel, were on the whole, very nice - most stopped to say hello to our children and all were happy to help. Oh, dear, what a dissapointment. After reading such glowing reports I was really looking forward to something special. Where do I start? Offhand reception staff, room stinking of stale cigarette smoke, Hard beds, watery coffee. Although these may be small annoyances, it's often the little things that colour your perceptions. To be fair, some of the waiting staff really tried to make an effort, and were extremely pleasant, but the reception staff couldn't seem to raise a smile even if you paid them. A holiday in one of my favourite places with a curates egg of an hotel. We arrived late with 2 small children, were very tired and unsure as to what we may find having booked independently. We were so very pleased with what we found. The staff were helpful, courteous and very on the ball. Our room was spotless with a beautiful view of the pool but no cot. mmm we thought how long do we have to wait for one to be brought up? 3 minutes - no lie and it was made with clean sheets and blankets and they set it up and went. Thats what we all like i think - a speedy resolution to any problem and that set the precedent for the rest of the holiday. Every meal was excellent, plenty of choice and even chips and gravy for those who cant be tempted to try something new (although i still heard a few good ole brits whingeing 'why is there always fish?!!'). The staff in every part of the hotel were happy to see you, pleased to serve you and could not do enough to help you. There were very few children in the hotel, which was great for all i think as not too noisy and the guests didnt feel overrun with kids! Even so the kids play room is excellent and plenty for them to do out of the way of the adults. Even though have 2 small children, I dont like to be surrounded with the noise of hoards of them! Predominantly English guests with a few Belgian, Spanish, French and German - all of whom added to the variety of the hotel. 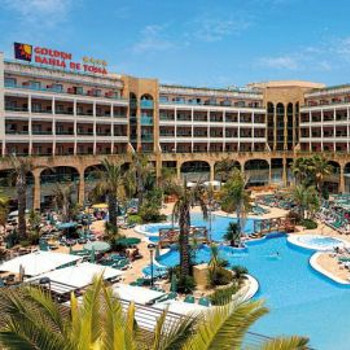 The pool area is lovely and plenty of sunbeds as you cant reserve - GREAT!! The hotel was a ahort walk from the town and beach and it really is a very pretty little twon, unlike some of the surrounding resorts. We were very apprehensive and we genuinely surprised at how picturesque Tossa is.